Last year, the Council on Foreign Relations published an article about the two current narratives on prospects for Nigeria. The first is positive when one notes the last peaceful handover of Presidential power. Events there have unfolded rather favorably since its Umaru Yar’Adua fell ill in late 2009 and the country was left leaderless. 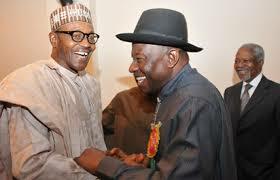 That raised fears of a military coup, but then Goodluck Jonathan emerged to fill the power vacuum, first as an extraconstitutional ‘acting president,’ then as a constitutional successor after Yar’Adua’s death and finally as the elected executive following the 2011 elections. This optimistic narrative notes that those elections were praised by international observers as better than in the past—and hence they reflected the will of the national majority. An amnesty for militants in the oil-rich Niger Delta, combined with disarmament, training and reintegration, ended a long insurrection there. Although it is highly debatable whether the Amnesty Programme can be said to have “ended” the oil insurgency (see Hinshaw’s article), it is true that Boko Haram is by far the most pressing security issue in the country now. It is becoming even more worrisome since the rise of al-Qaeda in post-coup Mali, a country with porous borders that is poised to become an epicenter for fundamentalism not only in the Sahel but West and East Africa as well. 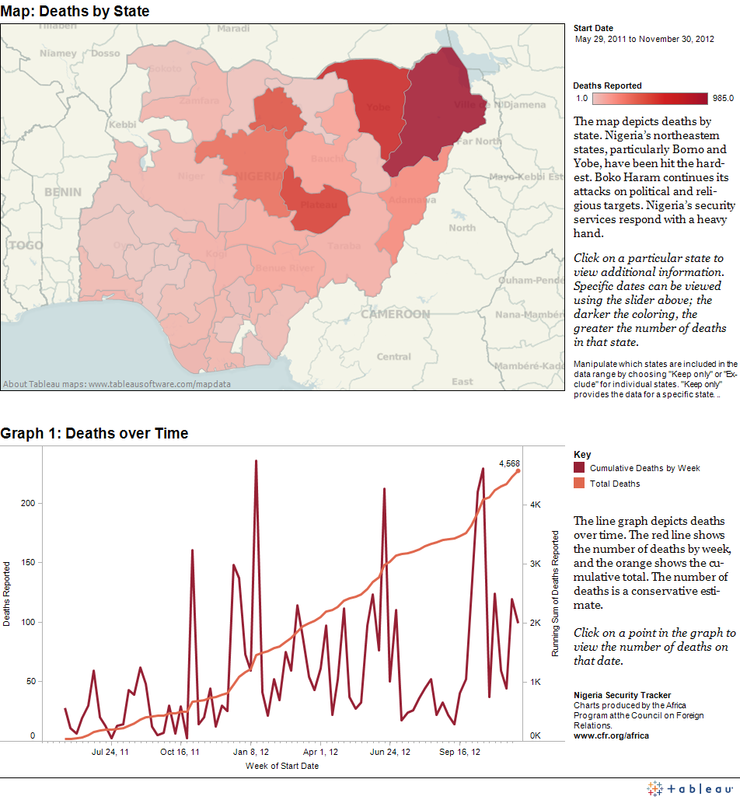 The Council on Foreign Relations has created the Niger Security Tracker in order to follow such developments. Perhaps in response to the recent WSJ article, a blog reader recently emailed to ask my opinion on the assertion that job creation stops militancy. There are two trains of thought, one is that oil companies should make the jobs as payment to Nigerians for use of land and the other is that the jobs should come from local and non-oil sources in order to contribute to a diversified and stable economy. I will start with the first. In my opinion, it is not correct when people say that job creation in the oil-related sector stops violence. Job creation lowers rates of violence because employment pulls non-committed militants away from the movement and simply keeps more men busy so they have less time for violence, but even once they are employed with foreign firms Nigerians are underpaid and have the lowest positions and rarely move up. Then they become disgruntled employees (as opposed to just disgruntled unemployed men). The reason that they are underpaid and have the worst positions is because they often don’t have the formal education, job skills, or work culture to function well at foreign oil companies. I would amend this idea to say that the creation of well-paid local jobs would stop the violence, but those jobs will never ever be well-paid when Chinese, Indian, and Russians workers are imported to Nigeria to work for the same amount, and be seen as better employees than local Nigerians. As to job creation in non-oil sectors, yes, that would lower violence but that is really a larger issue of overall economic development in Nigeria. Obviously if every Nigerian was gainfully employed with a good standard of living then that would presumably end the Niger Delta insurgency, since violence is inversely proportional to economic development generally. For me however, the sheer number of unemployed men in the Delta (surely hovering around 50%) will always outpace any increase in the number of local jobs created with any government program, so as one militant leaves the movement another one will replace him. So, theoretically non-oil jobs would probably end violence but realistically that would be improbably just based on the population number of the Delta. Alhaji Dokubo-Asari once stalked the mangrove-choked creeks of the Niger Delta, a leaf stuck to his forehead for good luck, as a crew that he ran bled oil from pipelines and sold it to smugglers. “Asari fuel,” they called it. Last year, Nigeria’s state oil company began paying him $9 million a year, by Mr. Dokubo-Asari’s account, to pay his 4,000 former foot soldiers to protect the pipelines they once attacked. He shrugs off the unusual turn of events. “I don’t see anything wrong with it,” said the thickly built former gunman, lounging in a house gown at his home here in Nigeria’s capital. The gilded pacification campaign is offered up by the government as a success story. But others say the program, including a 2009 amnesty, has sent young men in Nigeria’s turbulent delta a different message: that militancy promises more rewards than risks. Militants in Nigeria’s oil-rich Niger Delta began a campaign of kidnappings and pipeline bombings in the early 2000s, upset over pollution and the region’s endemic poverty. After a government-sponsored amnesty program in 2009, violence dropped and production went back up. 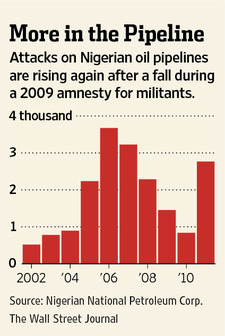 But oil theft, a lucrative criminal industry, has drawn many militants new and old back into the delta’s winding creeks. While richly remunerated former kingpins profess to have left the oil-theft business, many former militant foot soldiers who are paid less or not at all by the amnesty, and have few job prospects, continue to pursue prosperity by tapping pipelines. 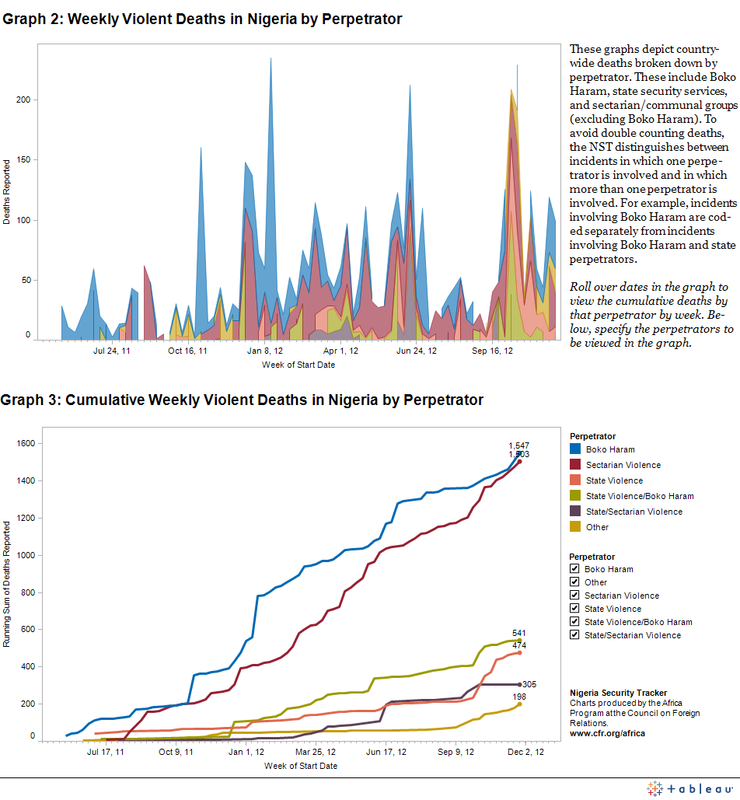 Meanwhile, Nigeria is facing a separate militancy, in the form of the radical Islamic group Boko Haram, whose guerrilla attacks on churches and police stations in a different part of the country have left hundreds dead. 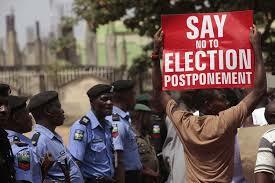 Some legislators have proposed extending amnesty to Boko Haram, as well. It is an expensive proposition. This year alone, Nigeria will spend about $450 million on its amnesty program, according to the government’s 2012 budget, more than what it spends to deliver basic education to children. Under the arrangement, the government grants living allowances to tens of thousands of former members of the bandit crews and sends them to vocational classes, in sites ranging from Houston to London to Seoul. These costs are on top of millions of dollars paid at the outset to the crews’ leaders for handing in their weapons. For a few, the program has meant spectacular rewards. To improve ties with former delta warlords, the government invited the top “generals,” as they call themselves, for extended stays on the uppermost, executive floors of Abuja’s Hilton hotel. Reuters Ex-militant Alhaji Dokubo-Asari, pictured here, who was granted bail in 2007, supported Nigerian President Goodluck Jonathan in 2012. Enticed by the program, the militants emerged a couple of years ago from the oil-soaked swamps of the delta. Some of the leaders took up residence in the executive floors of Abuja’s Hilton and through much of 2010 and early 2011 spent weeks or months enjoying the Executive Lounge’s complimentary supply of Hennessey V.S.O.P. cognac, priced at $51 a shot on the room-service menu. Over a buffet of fiery Nigerian dishes—gumbos, Jollof rice pilafs, goat stews—they rubbed shoulders with the country’s leading politicians and influence peddlers, who often live in the floor’s $700-a-night art-deco rooms. “These are young men who came out of the creeks and were given the opportunity to hang out with the crème de la crème, wearing gold watches and drinking from gold-rimmed teacups,” said Tony Uranta, a member of the government’s Niger Delta Technical Committee advisory group and a frequent Hilton executive-floor guest. “It’s a natural thing.” Most have since moved out of the hotel. “It’s too high-profile,” said an aide to one ex-warlord, Mr. Tom. The Niger Delta has seen promising economic progress. Construction on a regional highway is under way. 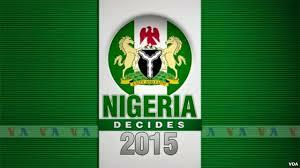 Nigeria’s overall economy is projected to grow at a brisk 7.1% this year. But much of the growth is in cities far from the delta, and a population boom reduces the degree to which the growth helps with the unemployment problem. In the delta, years-old electric towers punctuate village skylines, but many don’t carry electricity, having never been connected to the overtaxed power grid. Children travel to scattered schools aboard canoes, navigating creeks coated by the rainbow stains of oil slicks. A United Nations office has estimated it would take 30 years to clean the waters, which once sustained fisheries. Amid this landscape, oil-related crime lures locals like Atu Thompson, father of 18 and self-described oil thief, who says he and others see few other ways to provide. “You can take me to amnesty, give me a good contract—but others are still there,” Mr. Thompson says. 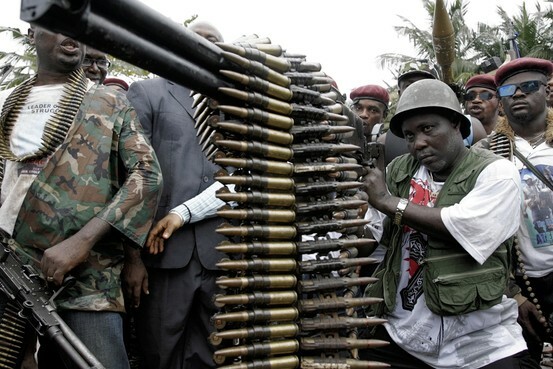 AFP/Getty Images Another ex-oil militant, Ateke Tom, turned in weapons as he accepted an amnesty in 2009. Mr. Dokubo-Asari, 48 years old, used to be prominent among them. While not all of his account of life in the mangrove swamps could be verified, he long was one of Nigeria’s best-known oil marauders. About 25 years ago, Mr. Dokubo-Asari left overcrowded university classrooms, he says, to study guerrilla warfare in the Libya led by Col. Moammar Gadhafi. He says he was given $100,000 to stir up trouble back in Nigeria, an oil competitor to Libya. Fomenting conflict proved easy in the restive Niger Delta he returned to in the early 1990s. From a local governor, Mr. Dokubo-Asari says, he procured weapons and money to build a militia that ultimately was several thousand strong. For years, as he tells it, they broke open pipelines, filling canisters with crude oil and refining some of it through timeworn techniques used by locals to boil palm-tree sap into wine. The government struggled to lure him out of the mangroves. Mr. Dokubo-Asari responded to one amnesty offer that he considered meager by announcing a death threat against petroleum workers. Shell evacuated hundreds of expatriates and oil derricks briefly slowed to a stop. The next day, oil prices hit $50 a barrel for the first time. 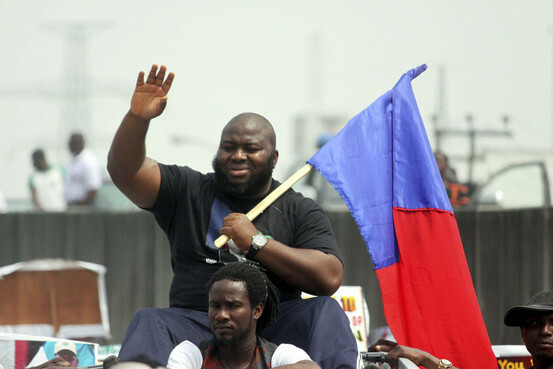 Nigeria’s government offered Mr. Dokubo-Asari a truce and $1,000 apiece, he says, for his AK-47 rifles, numbering 3,182. He says he took the deal and used the profits to purchase more weapons and return to the swamp. There, he recounts he was finally arrested and coerced into another round of negotiations. Fearing assassination, he fled to Cotonou, Benin, where he says he founded a school for Niger Delta children. He showed a video of him teaching kids kung fu at the school. New warlords quickly took Mr. Dokubo-Asari’s place. Marauding under noms de guerre like Gen. Shoot-at-Sight, Gen. Africa and Gen. Young Shall Grow, they formed a loose confederation of gunmen calling itself the Movement for the Emancipation of the Niger Delta, or MEND, and crippled enough oil infrastructure to bring Nigeria’s production on some days to a near-halt. That was when Nigeria announced the 2009 amnesty. In televised ceremonies, guerrillas dropped off rifles, machine guns, tear-gas canisters, dynamite bundles, rocket launchers, antiaircraft guns, gunboats and grenades to be sold to the government, which also offered the nonviolence training courses and nine-month vocational classes. Theft fell sharply. Yet now, just as Nigeria’s state oil company has begun institutionalizing pipeline-watch jobs for some ex-militants, theft has blossomed again. “It’s quite an escalation. If nothing is done, it will continue to increase because more and more people will just come to feel that this is a gold field,” said Shell’s Mr. Sunmonu. “We’re not going to give up on this and run away from it. We believe it can be stopped.” Maclean Imomotimi left an overpacked university four years ago, the muscular 30-year-old says, to rob barges in the Niger Delta swamps. Now, befitting his new career, he is known as Gen. Imomotimi.